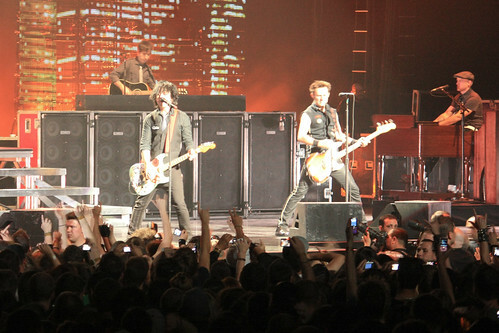 Green Day performing in Montréal. Photo from Jonathan Patenaude on Flickr with a Creative Commons license. That's what happened to me. When I was thirteen, I became increasingly curious about the outside world but had no real means to explore it. Then two things happened that would change my life. The first is that I got a copy of Green Day's International Superhits!. Between my parents, who listened to adult contemporary, and my friends who were getting into musical theatre, I was anxious to hear music I could actually relate to. And Green Day was pretty easy to find: on the radio, on television, and in the halls of Blake High School, on t-shirts and patches sewn to jean jackets. Their songs were fast and catchy, though as a preacher's kid, I was initially horrified by the foul language. But I'd spent plenty of mindlessly dull afternoons like the ones Billie Joe Armstrong described in "Longview," and was relieved to know someone else felt the same way. The second is that my friend had a birthday party at the Washingtonian Center, a "lifestyle center" in Gaithersburg that I'd never been to previously. Before that evening, walking felt like a punishment, something I did on those "Longview" afternoons when I didn't have a ride to any place more interesting. On those days, I'd walk 45 minutes to the shopping center closest to my parents' house, down streets with look-alike 1950's ranch houses and all while not seeing another person. It was boring, but slightly better than being at home. At the Washingtonian Center, walking suddenly became something fun. We could walk from the movies to an artificial lake, then look in store windows on our way to dinner. And we could do all of this while being around and looking at other people. Not only was it better than sitting at home alone, but it was more fun than going to the mall. I didn't question Washingtonian Center's authenticity at first, perhaps because I couldn't yet tell the difference between it and a traditional downtown. But I definitely wondered why Green Day called themselves a "punk band," which didn't seem to describe a group who played stadiums. Punks, I imagined, were more likely found in places like Phantasmagoria, the grungy and now-closed punk club in Wheaton. 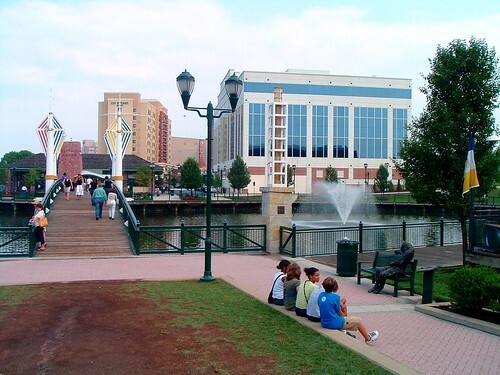 And it's because of Washingtonian Center that I began to explore downtown Silver Spring before it became a new "town center" in its own right, and taking Metro into the District to wander around there. I've always been interested in architecture, but it's trips to places like Washingtonian Center which got me excited in the spaces between the buildings, which is why I'm currently in school for urban planning. 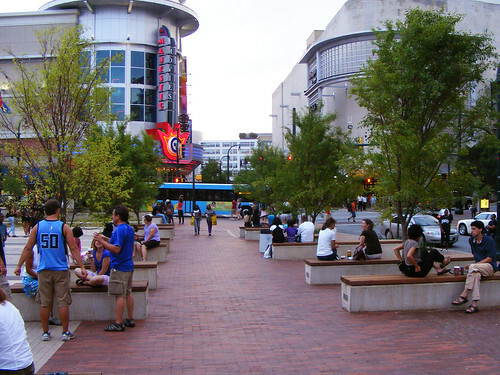 People may call downtown Silver Spring "fake," but it gets people excited about urban places. Much as I wouldn't have gotten into real punk if I hadn't listened to Green Day, I wouldn't be so excited about walking down real city streets had I not walked down a fake city street first. So for that reason, I'm not bothered when a new development is compared to a small town or an Italian piazza. Some of these places are like the Good Charlotte of urbanism, unable to be even a good fake downtown. But like a good punk song that can teach you to see yourself and your world differently, I'm convinced that a walk down a good urban street can do the same, whether it's in a city or a suburb, old or new. For more on the topic of punk rock and New Urbanism, check out this post from Scott Doyon comparing the two. This was really thoughtful, Scott. I agree - just because something wasn't the first, or isn't "authentic," doesn't mean it can't be a good rendition, and worth appreciating. I hate that downtown Silver Spring is viewed as "fake" by so many, while the "fake" part of downtown Bethesda gets a pass. I will admit, I was very skeptical of the Washingtonian Center. Then I visited and had to eat my words. It is great. I tend to frequent Bethesda more often, because it is closer to home for me, but I no longer complain when my friends up 270 make me go to Washingtonian. "I hate that downtown Silver Spring is viewed as "fake" by so many, while the "fake" part of downtown Bethesda gets a pass." Well, to be fair, A. It's pretty common for people to make fun of Bethesda (and Reston, etc.) and B. while I would never want to live in Bethesda over downtown Silver Spring, I also certainly think the "fake" areas of Bethesda are aesthetically much, much nicer than the junky building materials that make up the Peterson Co.'s "Downtown" buildings. I love how you've tied these two things together. 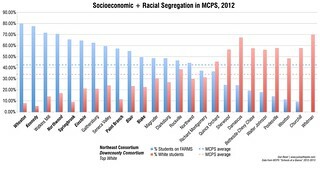 It's always interesting to see how differently people are influenced by the neighborhoods they grew up in at different times. 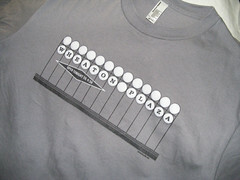 I can't remember a time when downtown Silver Spring was better than it is right now. It may have been better for the people who lived there before the 1960s or 70s, but that's kind of irrelevant at this point. It's definitely not perfect, but nothing ever is for every single person.